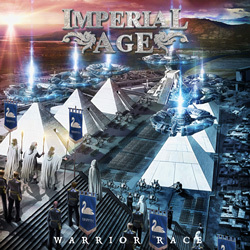 Whether they’re trying to conjure up visions of their Tsarist homeland of a century ago, or predict a majestic and decadent society of a time to come is of little importance; in their new album ‘Warrior Race’ Russian band Imperial Age have delivered a stirring, chest-beating, bombastic – in its truest sense – and anthemic album worthy of the opulence and magnificence of future days long past. The fact that ‘Warrior Race’ is released through Christofer Johnsson’s Alduruna label is of interest as, to be fair, the Therion comparisons are there for all to see – the same passionate and multi-layered vocals led by Alexandra Sidorova (a frontwoman with an incredible voice), the same attention to crafting exciting and innovative songs, and a broad, sweeping soundscape, in this instance created by having two sets of keyboards backing up a driving, relentless wave of melody and beauty. Working off a promo means I’m not 100% sure of the details, but Imperial Age came into being in 2012 and is the baby of one Alexander ‘Aor’ Osipov, who once fronted the band but now concentrates on one set of keyboards and providing some of the many backing vocals that make the band sound so seductive. There’s been a few line-up changes along the way, but the settled side of things now features, alongside Opsipov and Sidorova, Jane ‘Corn’ Odintsova (also on keyboards and backing vocals) Alexander Strelnikov on lead guitar and Maxim Novikov on rhythm guitar. A pair of Dmitrys – Rukhadze and Kovalev – provided bass and drums on a session basis, and as for guests, vocalists Fabio Lione and Sergei Lazar pop up from time to time, as does ex-Vader and -Dimmu drummer Dariusz Brzozowski and, naturally, a full-on choir. Having said all that, the details in this case are largely immaterial. ‘Warrior Race’ is a nine-course feast for the ears, topped off with a stirring, fourteen-minute live version of ‘Turn The Sun Off’, the title track of the band’s 2012 full-length debut, and is one of those albums whose songs themselves do the talking: material like opener ‘Anthem Of Valour’ and the title track are so wonderfully expressive and expansive as to render description superfluous. Just press play, and prepare to be overwhelmed. And did I mention that Imperial Age serve up a stunning version of ‘To Mega Therion’ as well, as rousing as the original but with a tad more panache?